A very straightforward card . . . until you get to its mana cost. Three mana is okay for four damage, especially in Standard where we generally accept that Lightning Bolt is not the baseline for every year, and even four mana is not out of the question. Even in non-mono-red decks, you will sometimes be able to engineer the sort of mana base that can come up with triple red, and the flexibility of being able to cast it for whatever mana you have available – even when that’s four green and two blue – really makes this card. It’s worth looking at in any setting, in any era. Flame Javelin is near and dear to my heart. When compared to Lightning Bolt, two more red mana for 1 damage is a bad deal, but that’s Lightning Bolt’s fault. Rather, Shock into Lightning Strike into Flame Javelin forms a nice sequence of escalating damage. The main reason to run this card of Exquisite Firecraft is that it is an instant, giving a lot more control and options. The most interesting thing about this card is it’s mana cost, part of an uncommon cycle from Shadowmoor. If you’re playing mono red this card is very appealing, but it gets less valuable the more colors you run. That being said, you can also cast this card without any mountains. I lost to a mono blue deck that used this card, needless to say I never saw it coming. You can have some fun with Flame Javelin’s mana cost. It works great for chroma and it counts as 6 for Volcanic Visions. Flame Javelin is one of the most underrated burn spells and it sports one of my favorite flavor texts to boot. 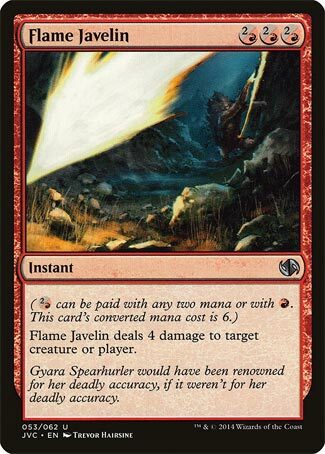 Three mana for four damage is an okay rate of return anymore; it’s certainly nowhere near the zenith of power for burn, but by the numbers, Flame Javelin is a perfectly serviceable burn spell. Exquisite Firecraft saw heavy play in Origins-era Standard, and Char was a key spell in Ravnica-era Standard. If you replace the red mana, the return gets worse: four mana, five mana, and even six mana are well below the average for this effect. However…look at it differently, and it looks better. For blue, six mana to deal four damage looks quite nice, since its burn options are long gone (save Psionic Blast in Modern). For green, it’s nice to have a burn spell that doesn’t ask for you to have creatures or to aim it at flying creatures. For white, it’s unconditional, which it doesn’t get. Black doesn’t care, since it gets a better rate of return, but three colors have a nice tool in Flame Javelin to do something they wouldn’t normally be able to do. I don’t think it’s a great card for them even now, as six mana is a tall order, but it gives an otherwise mediocre burn spell a bit of versatility.